Back in October, we reported that Netflix was reviving beloved series Gilmore Girls for four, 90-minute episodes. Now, The Verge is reporting possible story spoilers from photos of the set. 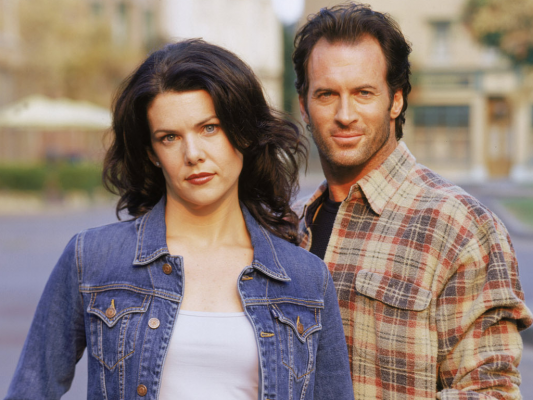 In the last episode of Gilmore Girls, fan favorite couple Lorelai (Lauren Graham) and Luke (Scott Patterson) appeared to have gotten back together after a broken engagement and a season apart. But did they stay together? Photos of the new set for the revival series have been making their way online, and wedded bliss may not be in the picture for Luke and Lorelai. A sign on one of the sets reads: “Lizzy’s and Luke’s House.” Who’s Lizzy? Could be a codename for Lorelai, or it could be an entirely new character. All is speculation as of now. What is known is that Ms. Patty’s dance studio got a new coat of paint and several cast members have expressed interest in returning to the series. Though, there’s been no official announcement about who’s coming back. What do you think? Do you think Lorelai and Luke ended up together? Who would you like to see return? I love, love, love that this is happening! The gilmore girls is my favourite show of all time! I continually watch all the original 7 seasons of it all the time, I never get bored, or tired of it. I can’t wait to see everyone involved in the show again.